Samuel Sayler came to America from Germany at age 8. He married Margaret Jones in 1773 in New Hanover Township, Burlington County, New Jersey. The 1773 Ratables state that Samuel Sayler resides in Springfield Tp. His son Charles was born in Springfield in 1786. About 1810, two of their children, Charles and Lavina came to Upper Canada from NJ with Margaret their mother, leaving behind the older children (Mary, Elizabeth, Frances, William, Samuel, John) who were settled by this time. It is not known why they came to Canada. Some of the children who stayed in NJ lived in Mount Holly near Springfield Tp. Saylors Pond and Saylors Pond Road are in the area and it is my assertion that they are named after this family as there was no other Saylor family in the area. Mary and John moved to upstate NY. All of the above is supported by evidence and this web page and those of the children are about presenting what is known and what seems probable. 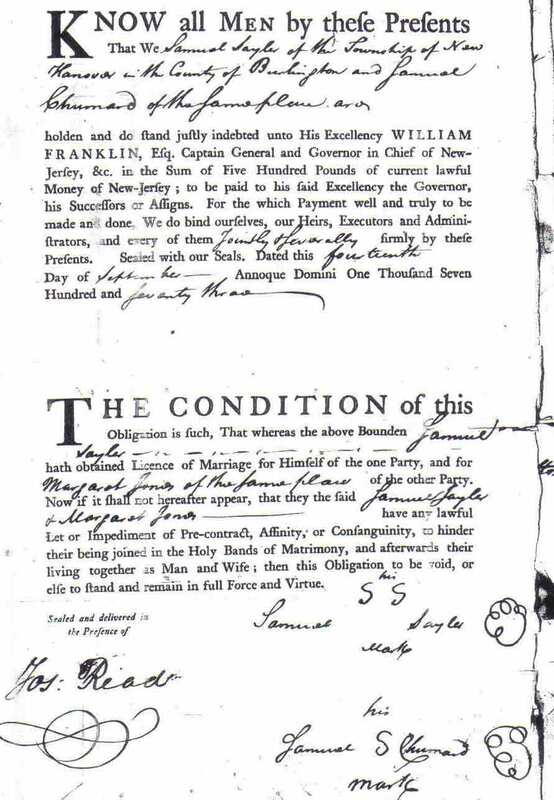 The image to the right is the 1773 marriage bann of Samuel Sayler and Margaret Jones. This is a large web page so use these links to navigate up and down. There are 5 key documents that link Samuel Sayler and Margaret Jones with children that stayed around Mount Holly, NJ and two of the youngest siblings who emigrated to Upper Canada with at least their mother. The source notes for everything in this 'overview' are presented in the various sections below. First: The 1773 marriage record of Samuel Sayler and Margaret Jones stating that Samuel lived in New Hanover Township, NJ. 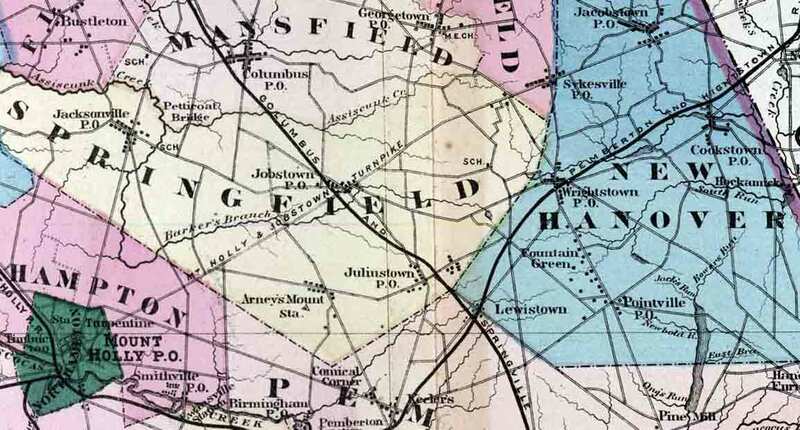 New Hanover Township was formed in 1723 out of Springfield Township and one other. The 1773 ratables state he lives in Springfield Township. As you will see below he lived near the border of these two townships. Second: This "Doyle Document" below from 1970 names their children who stayed in NJ and those that emigrated to Upper Canada. Third: The Albert C. Bowerman Document below written in 1904 gives a second confirmation that the parents of Lavina and Charles Saylor were Samuel Saylor and Margaret Jones from NJ. It also mentions Mount Holly, NJ, and this is where the older children and likely the parents settled by 1800. Fourth: The Saylor Family Bible dated 1856 in possession of my brother's family identifies "Town of Spring field" as the birthplace of Charles, the youngest son in 1786. Fifth: We need a map to tie all this together. See the 1872 map in the section below. It is all there together basically in one spot. In 1773, Samuel Sayler was said to be from New Hanover Township which includes Wrightstown. The road on the map joining Wrighstown to Jobstown is called Saylors Pond Rd. Saylors Pond is the circle under the 'D' in Springfield at the head of Barker's Branch Creek. Mount Holly where the family lives by 1800 is nearby. This is the home territory of Samuel Sayler and Margaret Jones and their family. I have made two trips to the NJ State Archives and in reading old records of the townships of Springfield, New Hanover and the town of Mount Holly in Northampton Township there are no other Sailer/Saylor families in the area at this early time. There are two other Saylor family groupings in the early NJ records in Gloucester and Salem counties which don't look closely related. Therefore it is with some confidence that I feel that the few Sailer families in the area are all connected to Samuel Sayler. These five records tie this family unit together. The children who stayed in NJ are identified as: Mary, Elizabeth, Francis, William, Samuel and John. Coming to Canada around 1810 are the youngest children, Charles (age 24) and Lavina (age 20) who came with "Samuel and Margaret". I believe these are their parents Samuel Sayler and Margaret Jones. No record has been found of Samuel Sr in Canada and he may have died soon after arriving or before. I also believe that Margaret remarried a man with the surname Schaffer. The reasoning is presented further down. Therefore I am suggesting that there were 8 living children (not 10) by the time Margaret, Charles and Lavina came to Canada. Charles and Lavina settled in Bloomfield, Prince Edward County, Upper Canada (Ontario) and lived a few farms apart. Research strongly suggests that daugher Mary married Gabriel Shutts and migrated to Cayuga Co., NY. Shortly after her brother John Saylor settled nearby in Tompkins Co., NY. It was a close knit community. See the web page on Charles Saylor for a more complete discussion of coming to Upper Canada. The Doyle document and the work of A.C. Bowerman appear to come from a common source. Albert C. Bowerman collected family stories and early lineages before 1900 in Bloomfield from elderly children of the first pioneers. Lavina Saylor was a great aunt of his and lived on an adjacent farm and died when Albert was 12. Albert included a two page Saylor History in his work but the first page is missing. I feel the 1970 Doyle information comes from the 1904 Bowerman source either directly or through knowledge of it. Dr Henry Saylor Doyle is a descendant of Charles Saylor. The Bowermans recorded much of their early history and this Saylor information was part of the allied family history. *Source: The "Bowerman" Family of Canada Descendants of Ichabod Bowerman of Dutchess Co., NY 1683 - 1796 by Albert C Bowerman, MB, Bloomfield, Can, July 1904, 165 pages, tissue carbon copy, AC Bowerman Records, Marion Cronk Fonds, Quaker Archives, p. 53, Image 87. The full transcription is available on this site from the Albert C. Bowerman page. It is my belief that Saylors Pond Rd and Saylors Pond are named after Samuel Saylor who married Margaret Jones. No early land record has been found stating who lived near Saylors Pond around the 1780's. The pond is just west of Fort Dix and south of Saylors Pond Rd. This map below is a small part of the Burlington County North 1872 map provided on line by Rutgers University. Saylor's Pond was located at the head of the Barker Branch of the Assiscunk Cr just under the "D" in "Springfield". Saylors Pond Rd, which still exists today, runs just above the pond and connects Jobstown and Wrightstown and is shown on this map but not named. The village of Springfield is right beside Jobstown and not shown on this map. Samuel Sayler and Margaret Jones are the parents of the family under investigation and they lived in Springfield Tp, Burlington Co., NJ. Assuming an age of 25 when he married in 1773 then his birth year would be abt 1748. Samuel Saylor is stated as "From Germany via Burlington, NJ." If Samuel is 8 when he emigrated and born about 1748 then the family would have emigrated about 1756. Know all men by these presents that we Samuel Sayler of the Township of New Hanover in the County of Burlington and Samuel Chumand? of the same place are holden and do stand justly indebted unto His Excellency William Franklin, Esq. Captain General and Governor in Chief of New Jersey, &c. in the Sum of Five Hundred Pounds of current lawful Money of New Jersey; to be paid to his Said Excellency the Governor, his Successors or Assigns. For the which payment well and truly to be made and done, We do bind ourselves, our Heirs, Executors and Administrators, and every of them jointly & severally firmly by these Presents. Sealed with our Seals. Dated this fourteenth Day of September Annoque Domini One Thousand Seven Hundred and Seventy Three. The condition of this obligation is such, That whereas the above Bounden Samuel Sayler hath obtained Licence of Marriage for Himself of the one Party, and for Margaret Jones of the same place have any lawful Let or Impediment of Pre-contract, Affinity, or Consanguinity, to hinder being joined in the Holy Bands of Matrimony, and afterwards their living together as Man and Wife, then this obligation to be void, or else to ftand and remain in full Force and Virtue. Note: This marriage is incorrectly listed under Samuel Sayles in the LDS website and also New Jersey Marriage Records 1665-1800, Wm Nelson, Genealogical Pub. Co., Baltimore, 1967.. The original clearly has the spelling as "Sayler". "Thomas Jones a weaver from England married Elizabeth Taylor in the U.S.A. and their daughter Margaret married Samuel Saylor who was born in Germany and came to America when he was 8 years old. They settled in Burlington New Jersey where they raised 10 children. Mary, Elizabeth, Francis, William, Samuel, John settled in the U.S.A., Charles, Samuel, Lavinia and Margaret came to Canada and settled in Prince Edward County shortly before the war of 1812. Charles Saylor came to Canada from Dutchess County New York. He was a miller by trade skilled in carpentry work and he bought land near Bloomfield. He was born in Springfield New Jersey in 1776 and married Jemima Hubbs daughter of Robt. Hubbs in 1812. 1. Mary - b - d. 1839. 3. Adam H - d - 1908 married Maturah Cooper. 5. Caleb ---------------- married Caroline Vandewater. Augusta Belle - Delphia Jane - Nellie Myrtle - Roberta Lee. Source: Transcribed by Doug Smith 4 Mar 2006, From a family summary typed for Doug Smith and others by Dr Henry Saylor Doyle in the 1970's after uncle Henry retired. Samuel Sailor, Springfield Twp, Burlington Co., Owes 5 Shillings, 5 pence tax. He is only shown as a householder. He is not a merchant, landowner, miller, owner of horses. He must be married as he is not taxed for being single. Source #2: Samuel Sailor/Saylor listed as BS (Burlington/Springfield from List 1, 1773/74, tax ratables list in Revolutionary Census of New Jersey, Kenn Stryker-Rodda, 1972, TRL 929.3749 S76, p 98. No colonial or post colonial land records for Samuel Sayler the elder were found in Burlington County and in particular, Springfiled or the Mount Holly area. No Sayler or variant entries for Samuel Sayler the elder. Prior to 1783 immigrants would seek naturalization to gain the same rights as British subjects. Mostly those with land would go through with this and pay the fees. No Saylor or variant was found. Source: New Jersey Archives, Third Series; Vol 1, Minutes of the Privy Council 1777 - 1789 and Vols 2-5, Laws of the Royal Colony of NJ with index. The Mount Holly and Springfield area were strong Quaker settlements. Indexes were checked for the Burlington Monthly Meeting and Mount Holly and Upper Springfield prep meetings. No entry for Sayler or variant was found. No Saylor or variant entry was found in the road books dealing with the Springfield Tp area. "A small lake at the head of Barker's Branch of Assiscunk Creek in extreme eastern part of the township [adjacent New Hanover Tp.]. First found on an 1849 map. The pond may have been named after Samuel Sailer of Burlington County, who died in 1832." Comment: The author Henry Bisbee speculates that the pond was named after Samuel Sailer Jr who lived his adult life in Mount Holly (see below #3). I think it more likely that this is the area that Samuel Sayler and Margaret Jones raised their family. They may have been tenant farmers. Charles Saylor, last son of Samuel Sayler and Margaret Jones, was born in "Springfield Township, Burlington County" in 1786 [Saylor family Bible in my possession]. Other than the name of Saylor's Pond and the Bible record, I have found no other record of them living at this site. See the 1872 map at the bottom of this web page. Close to Fort Dix - McGuire Air Force base, in Springfield Township, is a road named Saylors Pond Rd. It runs between Jobstown and Wrightstown and is visible but not named on the 1872 map further up on this web page. The pond is in the SW corner of Saylor's Pond Rd and Rt 68. See the Google map of Saylors Pond. No NJ Sailor/Saylors are found in the Revolutionary war index. No Thomas Jones or Saylor or variant found. Source: War Damages in NJ, British and American, Index Book 1776-1782, NJ State Archives, film number inadvertently not recorded. No record of death has been found for Samuel Sayler in NJ or Canada..
Did Samuel come to Canada and die soon after leaving no record of his arrival? Did his wife then marry a man of the name Schaffer? In the old Quaker cemetery in Bloomfield, Hallowell Twp., PEC, there is a long line of head stones which we might call the Saylor plot. The first burial there is for infant Charles Saylor who died in 1833 at 2 days old. Then, at the other end of the line, Margaret Schaffer is buried in 1835. The inscription reads: "Margaret Shaffer, d. June 18, 1835 @ 80 yrs 5 mo & 11 da." Thus she was born about January 1755. The next burial is Mary Saylor in 1839, the oldest daughter of Charles and Jemima. She is buried several spaces down the line from Margaret. Two more early burials are made; son Samuel in 1842 and grandchild Adam Henry Saylor in 1851. They are also buried down the line as seen in the photo in section 10 of the Charles Saylor web page. Then in 1853, Charles Saylor dies and is buried right beside Margaret Schaffer. Twenty three years later in 1876, his wife Jemima dies and is buried right beside Charles. It is clear that two spaces were reserved for Charles and Jemima beside Margaret Schaffer. This is not proof, but a strong suggestion that Margaret Schaffer is in fact Margaret Jones, the mother of Charles Saylor. This is supported by the Doyle Document that states that Margaret came to Upper Canada. Margaret was born in 1755 and thus is the right age to be his mother. Her name change would result from a later marriage. Charles being buried beside Margaret is an honour not lightly given. It is my strong conclusion that Charles is buried beside his mother. Source: Randy Saylor, old Quaker Cemetery, Bloomfield, PEC, across the road from the current Dutch Reform Church which was built on the location of the old Quaker Meeting house in the 1960's. The children below are all named in the Doyle document. Only Charles and Lavina have records that definitely name their parents. Mary and John both moved from NJ north to Cayuga and Tompkins Counties, NY and there is very good reason to believe that they are the children of Samuel Sayler and Margaret Jones. Samuel Sailor stayed in Mount Holly NJ and it is most probable that he is also a child of this couple. Little is known of William but he died in Springfield Township, NJ and is also very likely another sibling. Elizabeth and Francis have not been found in the record. Those children with links have more information on separate web pages. SAMUEL SAYLER was born about 1748 in Germany. He likely died in Burlington County, NJ. He married Margaret Jones, daughter of Thomas Jones and Elizabeth Taylor on 14 Sep 1773 in Township of New Hanover, Burlington Co., NJ. She was born about 1755. She died in 1835. SAMUEL SAILER was born in 1778 in New Jersey. He died on 13 Dec 1831 in Mount Holly, Burlington Co, NJ. He married HANNAH IRICK. She was born about 1780 in New Jersey. She died on 21 Feb 1838 in Mount Holly, Burlington Co, NJ. WILLIAM SAYLER was born abt. 1780 and died in 1834 in Springfield Township, Burlington Co, NJ. He married MARGARET. JOHN SAYLOR was born on 20 Mar 1785 in NJ. He died on 02 Apr 1842 in Hector, Tompkins Co., NY. He married Mary Bower before 1811. She was born in 1788 in near Easton, PA. She died on 09 May 1858 in Winnebego Co., IL. CHARLES SAYLOR was born on 24 Dec 1786 in Springfield, Burlington Co, NJ. He died on 19 May 1853 in Prince Edward Co., ON. He married Jemima Hubbs, daughter of Robert Hubbs and Jane Haviland on 02 Apr 1812 in Hallowell, Prince Edward, Ontario, Canada. She was born on 16 Oct 1790 in Hempstead, Long Island, NY. She died on 18 May 1876 in Prince Edward Co., ON. Children of Samuel Sayler and Margaret Jones. Stayed in NJ William Lived in Springfield Tp., died.1834, m. Margaret. 7. Mary Sailor who married John Irick in 1761. Mary Sailor is possibly the older sister of Samuel Sayler who came to America at age 8. John Irick (1740-1826) married Mary Sailer (b. abt 1744) in Burlington County on February 28, 1761. This Mary Sailer Irick died January 16, 1771 which is also documented in an obituary. John Irick married his 2nd wife, Mary Shinn, on February 26, 1781. John Irick and Mary Sailer had one known child, William Irick, born December 1, 1768. He married Margaret Stocton and had two known children Nancy Ann and John Stockton Irick. This John Stockton Irick's marriage to Emaline Bishop produced 7 known children. One of these children, great child Rachel Bishop Irick, married Charles Sailer who is in our/my direct line. He is the son of our John Irick Sailer and grandson of Samuel and Hannah Sailer. This is a very early marriage and because the first born son of Samuel Sailer Jr and Hannah Craft is named "John Irick Sailer" it strongly suggests that Mary Sailor is related to the family. Note that Mary is a "spinster" so is likely in her early twenties at the time of the marriage. Secondly, a daughter of a later generation, Mary Saylor, who married Gabriel Shutts, names her son Irick. This was in 1851 when they had moved to Ohio. The surname Irick had meaning within the family. I feel that Mary Sailor who married John Irick in 1761 is likely an older sister of Samuel Sayler Sr who would have been about 13 years of age in 1761. 28 Feb 1761, "John Irick & William Budd minor both of the County of Burlington in the Western Division of the province of New Jersey" are indebted to the Governor in the case that the marriage has "impediments". The licence is for John Irick and "Mary Sailor of the same place, spinster" to marry. The licence is granted on the date noted. Source: Marriage Banns and Licences, NJ, Liber I, 1711-1796, NJ State Archives, reel 1, p. 19 or New Jersey, Marriages, 1678-1985, FHL film 888705, p. 19, on line index familysearch.org. To see an image of the licence click here. Comment: this index at familysearch has the marriage in Monmouth Co, NJ on film 802939, p. 19. Monmouth Co is in East Jersey but Upper Freehold and Dover townships border New Hanover Tp in Burlington. Possible they married in Monmouth. This could be an error. Note that these compare closely with other Saylor tests (groups 3 and 4) a few of whom know they came from Binninngen or Bottmingen, Switzerland. Both of these are today suburbs of Basel, Switzerland. Given these close results it can also be concluded that the Saylor ancestors of Samuel Saylor of Springfield Tp., Burlington Co., NJ came from in and around Basel, Switzerland. It would be wonderful if a Sailer descendant from one of the sons who stayed in Mount Holly and also John Saylor of Hector Tp., Tompkins Co., [now Schuyler] NY, would come forward and be tested. This would confirm the argument presented here.